The opening scene hath a bit of comedy after last week's rather tragic loss of their mentors. Tyramigo is lost and Kou wants to find him. I find this face-pinching scene funny and shippy at the same time. Granted that Asuna is indeed physically the strongest of the group -- I'd hate to imagine Kou's face getting ripped off here! Though it seems Asuna's strength only kicketh in when she's either agitated or in the face of danger -- which may explain why Kou's face doesn't get ripped off here! What's interesting to know is that Menasaurs are actually born from negative emotions. 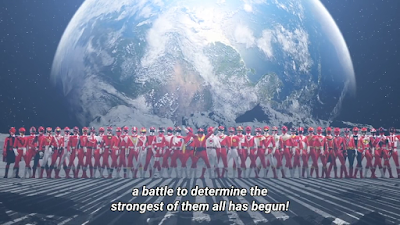 Think of Orgs from Gaoranger! A fencer surnamed Mishima (and no, he's not related to the Mishimas of Tekken lore) has become Creon's next target. I do find this scene somewhat nightmarish even if the CGI is obviously used for a a show that's aimed at children seven and upwards. They are now getting into the city life. Remember that girl Ui from the last episode? We discover that they are part of an archaeological team. Melt gets to read through the manuals about dinosaurs. Her father Naohisa thinketh of them as her friends she hath brought over. Won't a father be suddenly baffled if her daughter's friends are Japanese-looking people wearing European style clothes from the Middle Ages? 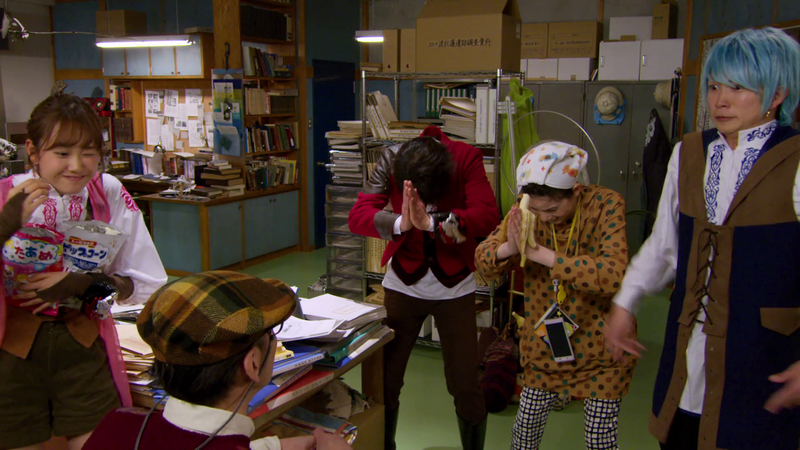 I hope the Ryusoulgers will start wearing modern day outfits and only use their uniforms when it's an emergency. I just have a feeling though that Ui and her father would soon end up helping the Ryusoulgers find whatever Bandai merchandise they need in future episodes! Ui meeteth the fencer Mishima. I find it funny when Kou rashly rusheth into the scene thinking that said person is an Ryusoulger. 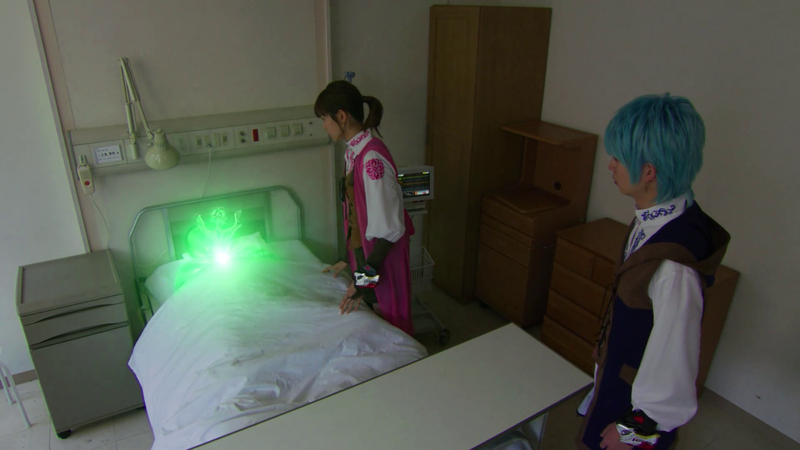 They still remember the words of the Ryusoul Elder about two more Ryusoulgers? Kou is somewhat funny though I doubt it he's going to be all that of an idiot. I find him way better than Daigo Kiryu in Kyoryuger though. I hope that he doesn't start grabbing all the attention from the others soon enough! This new monster of the week is the Unicorn Menasaur. He's a fencer because he's born from Mishima's desires to be number one. There's also a bit of a fart joke going on. I kinda laughed at this one. Creon takes advantage of this fiasco to escape. 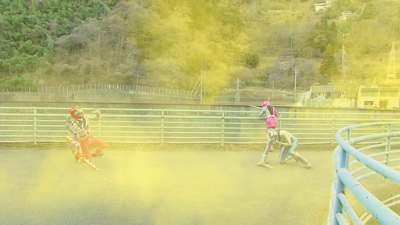 I wonder would the Ryusoulgers eventually master this fart joke thing or will it be written off as a bad joke? Hopefully, they can utilize this one! This scene in the hospital may be considered nightmarish. The energies are drained from human hosts -- which explaineth why Mishima had chest pains earlier on! Asuna and Melt follow the energy only to discover that the Unicorn Menausar has fully enlarged! Both Ryusoulgers go into the city while Kou is looking for Tyramigo! Well children DO love dinosaurs as they play on Tyramigo. I guess we're going to see toy sales rise up or not? 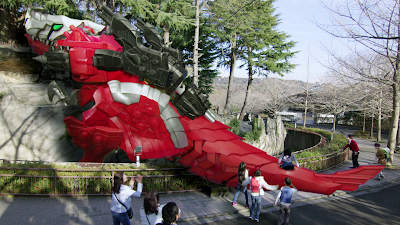 Fortunately Jurassic Park/World is a completely different continuity from Ryusoulger. 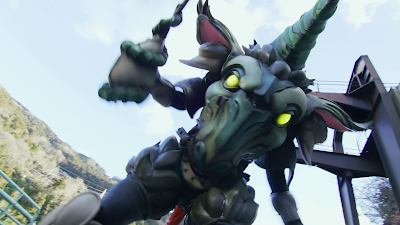 I'd hate to think if Tyramigo got captured and got put in an amusement park. Kou then realizeth that Unicorn Menausar has enlarged! This scene is just badass and somewhat head-scratching. 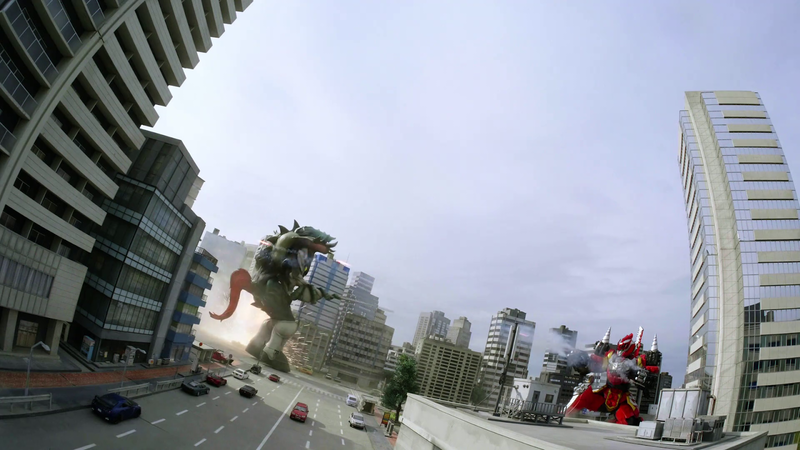 It's almost like how in the world does Japan keep surviving having giant monster battles EVERY WEEK? Both Ryusoul Blue and Ryusoul Pink do whatever they do to keep the monster at bay. It reminds me of Ohranger's first episode and Carranger's episode where Grotch got accidentally enlarged. Kou then realizeth that they need to have their souls as one. The Tyramigo goes into knight mode and finisheth off Unicorn Menasaur. Though I'd hate to think about somebody losing their car, traffic or worse who got stepped on during the giant monster fight. Then again Japan is so well-prepared for disasters only a real idiot would get caught and stepped upon in this kind of scene, right? 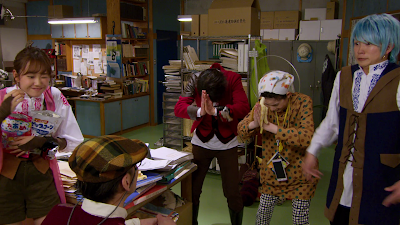 Mishima is reunited with his wife and daughter who the Ryusoulgers met earlier. 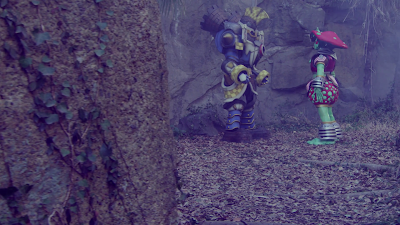 The Ryusoulgers walk away after they see the happy reunion. Ui is more than satisfied to see the day wrap up. Both Ryusoul Black and Ryusoul Green are seen training further. A mysterious figure appears. Just who in the world is he? Who was also the mysterious figure who showed up at the same time before this scene? I wonder is he a villain or hero? I just want to assume he's a villain and could be the Big Bad of the series. 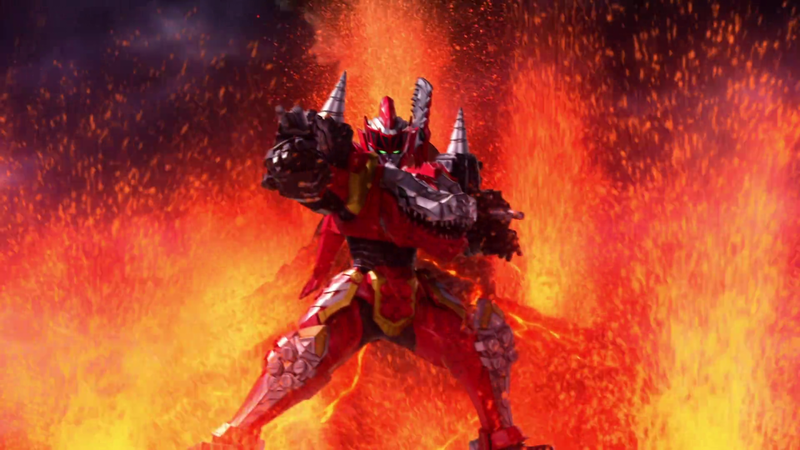 Then he could be the Ryusoul Elder in disguise trying to bring them back. What in the world is going on? 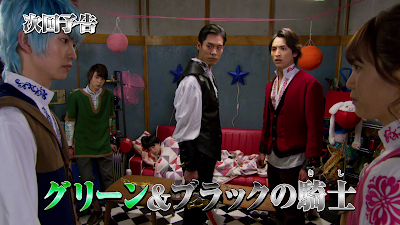 Next week, the Ryusoulgers will meet the siblings Towa and Bamba for the first time. Just then I suddenly think about Hurricanger and the Gouraiger siblings. It looks like that they are not really ready to officially join the team yet. 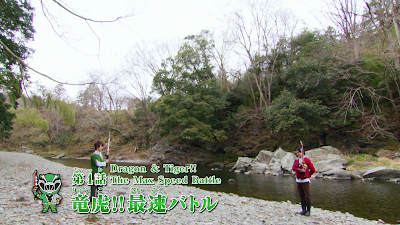 Hmmm I just hope we're going to get a short arc dedicated to them accepting their place as Ryusoulgers!